As a child, visiting my grandparents in New Buffalo, Michigan was always something my brother and I looked forward to. Upon arrival, we would run straight to the family photo albums and peruse through the new pictures. My grandmother had the charming tendency to photograph every visitor and/or stranger, whether a carpet installer or grand-child, so there were always new photos to be had! My brother and I would then spend a lot of time in the lower level of the house, away from our parents’ watchful eyes. Downstairs, now that was where the serious fun was – cards, TV, board games, and the like. In that same room were several paintings, including portraits of my grandparents and one of an unknown fisherman holding his catch of the day. As I got older and became more curious, I learned the fisherman was actually my great-grandfather, William Alderson, and the painting was based on a photograph taken at Gravel Lake, near Lawton, Michigan. Here is an image of the painting on the wall. William Alderson was born in Allegheny County, Pennsylvania in July 1894, joined the National Guard in 1917 and later served in France during World War I, and after returning to the United States, married Julia Kamp in November 1919. Their first child – William, my grandfather – was born in 1922 in Pittsburgh, and the family moved to Chicago soon thereafter. William – the fisherman – died in April 1951 and is buried in Bly Cemetery near Marcellus, Michigan, a short drive from Gravel Lake. The fisherman painting clearly held a place of prominence at my grandparents’ house, and I regret not talking to my grandfather more about it and his family. Rather, his World War II stories were always more enthralling to me as a youngster. One can imagine my excitement when I stumbled across an actual photograph of “the fisherman” during a visit with my great-aunt – a particularly gratifying find! 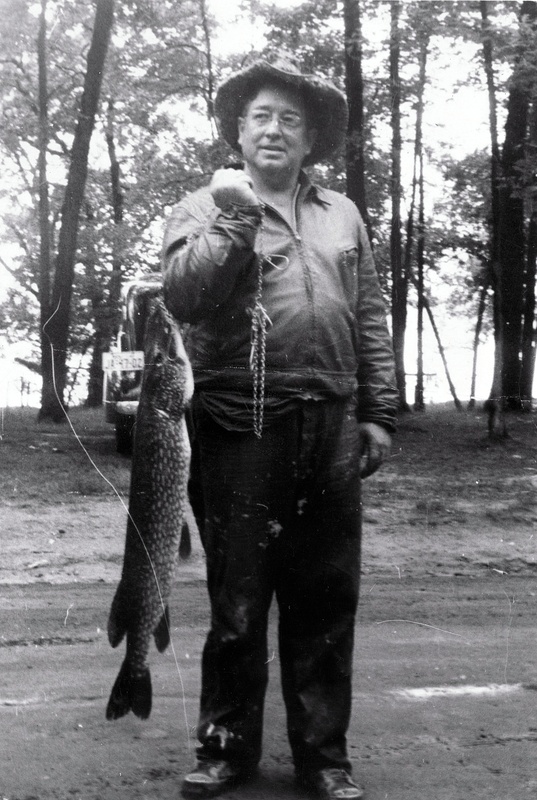 Here is the actual photo of William Alderson, showing his catch of the day at Gravel Lake, taken c.1940. I’m no fisherman, but that’s an impressive catch…. This entry was posted in Family Studies and tagged Alderson, Gravel Lake by krisrze. Bookmark the permalink.